On graduation day in 1954, San Diego High School star athlete Floyd Robinson was signed personally by Bill “Chick” Starr, the owner of the Pacific Coast League San Diego Padres, for a reported $500 bonus.1 He appeared in three games — two in the outfield. He was 3-for-6 at the plate, and handled all eight chances on defense, then was optioned to the Boise Pilots of the Class-C Pioneer League on July 19. For Boise, he hit for a .326 average in 46 games. In the fall of '52 he became starting quarterback on San Diego High’s football team. As a quarterback who had traveled with his team to the national high school finals in Denver, Robinson was recruited but declined the offer of a football scholarship at the University of Arizona. An American League fact sheet put out in 1969 said that his favorite targets on his high school team were Deron Johnson, who played 16 years of major-league baseball, and Art Powell, who played 117 games in 10 seasons as an end and defensive back, primarily in the American Football League. Floyd Andrew Robinson was born in Prescott, Arizona, on May 9, 1936. His father George Robinson was an automobile mechanic who later owned an auto repair shop at 16th and Imperial in San Diego. Robinson spent almost all of 1955 with the Salem (Oregon) Senators in the Class-B Northwest League. He hit .301 at the higher level, playing in 102 games. Robinson started the 1960 season with San Diego again. The Padres had been affiliated with the Cleveland Indians before he went into the service but had a working agreement with the Chicago White Sox when he came out. In 101 games for the Padres in 1960, Robinson hit .318 (.404 OBP) with 13 homers and 48 RBIs. He was summoned to the big leagues on August 6 and debuted with the Sox on August 10, 1960. The White Sox under manager Al Lopez had won the American League pennant in 1959, losing the World Series in six games to the Los Angeles Dodgers. Lopez was still at the helm and they were very much in the hunt when Robinson joined the team, replacing outfielder Joe Hicks. On August 8 the Sox were just half a game out of first place, trailing the New York Yankees. They lost to the Yankees the next day, then Robinson started in right field on the 10th. He had to wait a while for his first major-league base hit. It didn’t come until more than a month later, in his 12th game, on September 18. In six of those 12 games, he had been a pinch-hitter and in one a pinch-runner. Though he didn’t get a hit, he did reach first base four times by working walks, and he scored twice. September 18 was a big day. Robinson played both halves of a doubleheader in Detroit. He was 2-for-3 in the first game, with his first run batted in (and a stolen base, too), and 1-for-3 in the second game. He scored once in each game. The RBI was his only one of the season, but he got on base with a .431 OBP, walking 11 times, batted .283, and scored seven runs. For the next six seasons, Robinson was a starting outfielder for the White Sox, appearing in an average of 143 games per season. Most of the time, he played right field—though in 1962 the bulk of his work was done in left field. When not in the field, he pinch-hit or pinch-ran in about 10 games. Al Lopez remained his manager for all but the last of Robinson’s years with the White Sox. Robinson got off to a terrific start in 1962, driving in 22 runs in April alone. His biggest single day on offense was on April 17 in Minneapolis, when the White Sox beat the Twins, 8-0. Seven of those runs were driven in by Floyd Robinson, with one homer and two doubles among his four hits. He had captured the attention of many in the city, and even had a Little League organization named after him. By season’s end, he had 109 RBIs (fourth in the American League), a .312 batting average, and a league-leading 45 doubles. On July 22 he was 6-for-6 (all singles) in a nine-inning game, as Chicago beat the Red Sox in Boston, 7-3. Robinson placed 10th in the MVP voting. In 1963, the White Sox finished second, but it was a distant second, 10 ½ games behind the Yankees. Robinson was second on the club to Pete Ward in RBIs (71) and batting average (.283), but his numbers had clearly dropped off significantly since the year before. He did add a couple of homers, hitting 13. He never had tried for home runs, he explained early in the year: “I could hit maybe 20 to 25 homers a year if I tried but if I did it would take 30 to 40 points off my batting average.”17 His first half of the season was strong, but he seemed to lose some steam in midyear. Robinson’s cousin Tommie Reynolds went to different schools in San Diego (Lincoln High and San Diego City College) but played eight years in the major leagues starting in 1963 as an outfielder with the Kansas City Athletics. In 1964, with Robinson’s salary the same as in 1963, he nudged his average up to .301 — the last time he would hit that high — but his RBI production dropped to 59. He hit fairly consistently throughout the year, and the .301 batting average put him in fifth place in the American League. Wendell Smith of the Pittsburgh Courier dubbed Robinson “the quiet man,” offering a glimpse into his personality in a late August column.18 The team finished in second place, just one game behind the Yankees (and one ahead of the Orioles). The 10-team league had not been broken into divisions and there was no wild card. This was as close as Robinson ever came to postseason play. In 1965, Robinson married. His wife Sandra had graduated from San Diego’s Lincoln High School. The Reds used Robinson as a pinch-hitter almost as often as in the outfield, in some 21 games. He was batting .240 when injured in the July 18 game, wrenching his right knee while batting. A week later, he started the game in right field but came out after three innings with another twisted knee. His one at-bat had resulted in a groundout, and his season was over, with a .238 average. He was placed on the disabled list and saw no more action. Robinson played in 53 games for the Athletics and was batting .247 with 14 RBIs. On the last day of July, the Boston Red Sox purchased Robinson’s contract from Oakland. Boston primarily used him as a pinch-hitter. He had 28 plate appearances in 23 games, with a .125 batting average and a .250 on-base percentage. The only game in which he posted run statistics was on August 27 against Cleveland — he drove in two runs and scored one. Those were his totals for the Red Sox: two RBIs and one run scored. The Red Sox released him to their Louisville farm club at the end of October. 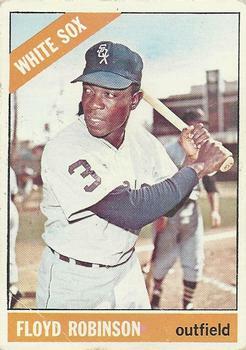 Robinson’s last year in professional baseball was in 1969. He was signed as a free agent by the Pacific Coast League’s Hawaiian Islanders in late December.25 He played in 140 games, with 591 plate appearances. He hit .266 with 10 homers and drove in 53 runs, scoring 82 runs. In July 1970 the San Diego Union reported that he had opened Floyd Robinson’s Liquor Store in the city at 58th and Market.26 The shop also sold groceries. He sponsored three Little League teams from the store as well as a men’s softball team and a bowling team. In 2009, Robinson was inducted by both the San Diego Hall of Champions and the Breitbard Hall of Fame, both honoring athletic accomplishments by San Diegans. This biography was reviewed by Norman Macht and fact-checked by Mark Sternman. In addition to the sources noted in this biography, the author also accessed Robinson's player questionnaire from the National Baseball Hall of Fame, the Encyclopedia of Minor League Baseball, Retrosheet.org, Baseball-Reference.com, Rod Nelson of SABR's Scouts Committee, and the SABR Minor Leagues Database, accessed online at Baseball-Reference.com. 1 The amount of the bonus was reported by Phil Collier, “Pitchers All Look the Same to White Sox’ Robinson,” San Diego Union, May 21, 1961: 121. 2 “Robinson Bags Prep Loop Bat Homers -- .508,” San Diego Union, June 6, 1954: 55. 3 “Floyd Robinson, McAnany Share Helms ’54 Award,” San Diego Union, June 12, 1954: 17. 4 Ed Sainsbury, UPI, “White Sox Best Investment for $500, Robinson,” Chicago Daily Defender, September 20, 1961: 22. 5 Steve Snider, “Sox Youngster Sticks to Facts,” Chicago Daily Defender, April 30, 1962: 24. 6 Robinson To Be Drafted,” San Diego Union, March 12, 1954: 17. 7 Bill Center, “Robinson A Hero in a Less Hectic Era,” San Diego Union, July 2, 1975: 29. 8 Phil Collier, “Kiner Squelches Rumors Then Starts ’61 Planning,” San Diego Union, August 18, 1960: 15. 10 Ibid. See also Edgar Munzel, “Floyd Pack Dynamite on Small, Wiry Frame,” The Sporting News, November 10, 1962: 3. The pitcher’s name was Jerry Walker. It was the first of 11 homers Robinson hit in 1961. 11 Associated Press, “Piersall Top Fielder in AL,” Omaha World-Herald, December 21, 1961: 28. 13 Lee D. Jenkins, “Threatens Motel For Housing Six Tan Sox Players,” Chicago Daily Defender, March 15, 1961: 22. 14 Minnie Minoso, Juan Pizarro, and Al Smith were the other three players who resided at the Desoto Motel through spring training. “White Sox Buy Hotel,” Milwaukee Journal-Sentinel, November 10, 1961: 42. 15 George Langford, “Floyd Robinson Has Come Into His Own on Diamond, But A Novice As Publicist,” Chicago Daily Defender, July 19, 1962: 22. 16 Richard Dozer, “Sox 1-2-3 in Chicago Star of Year Vote,” Chicago Tribune, December 30, 1962: B5. 17 Paul Zimmerman, “Floyd Robinson, Once Ignored, Big Man in White Sox Outfield,” Los Angeles Times, April 6, 1963: A3. 18 Wendell Smith, Floyd Robinson Is A ‘Quiet Man’ Whose Bat Talks When His Is Needed,” Pittsburgh Courier, August 29, 1974: 24. 19 Lawrence Casey, “Robby’s Fast Start Spurs Sox,” Chicago Daily Defender, April 21, 1966: 44. 20 Jerome Holtzman, “Floyd Robinson Hits Headlines — At White Sox Contract Time,” The Sporting News, February 19, 1966. 21 He did collect one hit after being inserted as a pinch-runner and remaining in the game. 22 Robert Markus, “Flayd’s Star Fading, But It Isn’t Out Yet,” Chicago Tribune, July 3, 1967. 23 Edward Prell, “Sox Trade Robinson for Jim O’Toole,” Chicago Tribune, December 16, 1966: E1. 24 Associated Press, “Athletics Get Floyd Robinson,” Chicago Tribune, November 23, 1967: D3. 25 Associated Press, “Islanders Sign Robinson,” Seattle Daily Times, December 25, 1968: 59. 26 Frank Rhoads, untitled column, San Diego Union, July 7, 1970: 14.